According to this trailer, the battles in this game are not like you are used to. You will have something like forty characters on your side during battles, and it looks like you have limited control over what they do, as they are shown crazily attacking everything on the screen in a mixed salad of steel and magic. Every three hours, your army goes into a “Fever” and attacks at will. Apparently, you’ll fight Kefka at some point, too. SPOILERS. It also looks like you will be able to add series favorites like Cloud or Kain to your army, but for – Ughhh – in app purchases for $0.99 each. There are 35 of these “Premium” characters, and when you purchase them they come at random. So even if you wanted Cloud, you might have to spend tons of money to get him. You can also buy extra stages. SOUNDS GREAT. 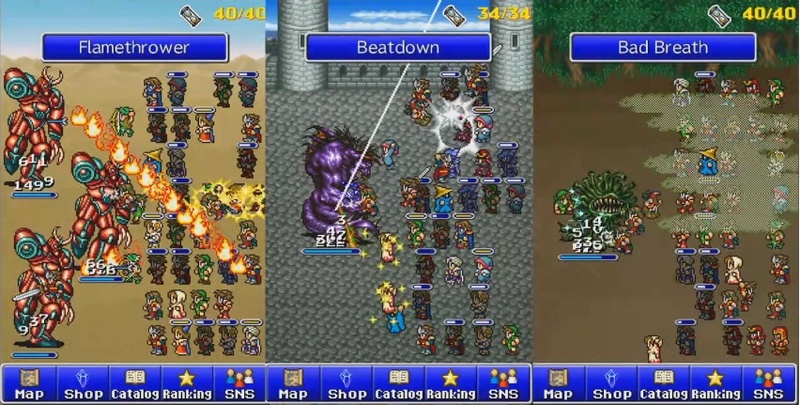 You can purchase Final Fantasy: All the Bravest on the 17th for $3.99. I may not be reading deep enough between the lines here, but is it not possible to unlock these “premium” characters in game if you play long enough, or is this something that is just not known? The video makes it look like the named characters just show up, but no, Square Enix wants you to pay $40 for this game.